The French have done their best to undermine coalition efforts in Iraq. So why would terrorists do anything to embarrass them? http://www.jewishworldreview.com | Those two French journalists are still missing in Iraq, where they're being held by still another band of terrorists. Following Spain's lead after Madrid's rail system was bombed and scores of innocents killed, the French will now doubtless seek to appease the kidnappers by announcing that French troops will be withdrawn from Iraq at once. Oops. Unlike the Spanish, the French never sent any troops to Iraq in the first place. There are none there to withdraw. Indeed, the French have done their best to undermine coalition efforts in Iraq. So why would these terrorists do anything to embarrass France? Even to ask such a question is to misunderstand the nature of terrorism. It is to assume that terrorists need a reason to terrorize. If terrorists were rational, of course French citizens would be immune to such attacks. Few countries were as supportive of Saddam Hussein's regime as France. It was one of Saddam Hussein's major trading partners, money lenders, and arms suppliers, even building him a nuclear reactor -- the one the Israelis took out in 1981. French officials helped undermine the economic sanctions against Saddam's regime, and they played a leading role in the United Nations' oil-for-food scam. Even after that regime was toppled and Saddam himself jailed, the French have held back from the coalition trying to build a stable, democratic Iraq. What could these kidnappers demand that the French have not freely given them? To quote the New York Times' correspondent in Paris, who sounds as if she's got this thing figured out, "what animates the French and their Islamic adversaries is not a battle over the future of Iraq. The Muslim militants make no distinctions in their war against the West." In this case, the kidnappers demanded that the French "rescind a new law banning Islamic head scarves and most other religious symbols in public schools, a demand France rejected." But any excuse would have done. If the French hadn't just outlawed head scarves for Muslim girls in their schools, surely the terrorists would have found some other demand to make. Whether in Baghdad or Beslan, there doesn't have to be any reason for the terrorists to act, only victims ready to be slaughtered. In a part of the world where fanaticism rules, the most fanatic tend to win out, and so the pressure is on to commit ever more outrageous atrocities. 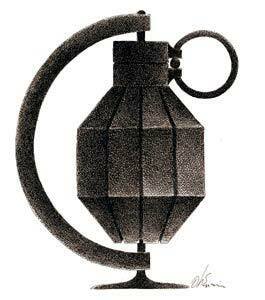 By now suicide bombings have become old hat. So we get attacks on schools full of children and beheadings in front of the cameras. Each new outrage trumps the last in this grisly competition for the allegiance of the hate-filled street. Every time you believe terrorists have done the unthinkable, they think of something else. The moral of the story: It's not what the West does or doesn't do, or any policy it does or doesn't adopt, that infuriates the Muslim world's fanatics, but that the West dares exist. Which is why France, a nation that has opposed American policy in Iraq, is still considered fair prey. By now a wide assortment of leaders around the world have appealed for the French captives' release, including Carlos the Jackal, aka Ilich Ramirez Sanchez, whose address at present is a French prison outside Paris. That notorious terrorist was convicted of a series of kidnappings, bombings and general bloodletting a few decades back, and has been taking up good French jail space ever since. The Jackal has just issued a statement from his cell explaining that all other nationalities "in the service of the imperialist aggressor" should be subject to attack, but that the terrorists should give the French a free pass in Iraq-as a reward for their opposition to American policy. As long as Carols the Jackal is alive, he'll doubtless be giving terrorists advice. Which makes him Exhibit A in case for capital punishment. If Timothy McVeigh were still on this side of the Great Divide, doubtless he'd be giving advice from his cell, too. And there would be those eager to lionize him. or even follow his example. Carlos the Jackal has become something of a literary hero in France. Think of him as a kind of Che Guevara who escaped execution; look for his picture on T-shirts any day now. Thankfully, Timothy McVeigh is no longer with us. Yes, the kidnapping of the French journalists, and the wide variety of responses to it, offer all kinds of lessons about where appeasement leads, but it's unlikely Paris will learn them. In charming, picturesque Old Europe, it's still 1938.